I was in the “Fanta Sea” gift shop this morning. On a table, I found a bucket filled with teal colored conch shells and quickly held one to my ear. Since I can remember I believed if I held a seashell to my ear and listened carefully, I would hear the sounds of the sea. Somehow I loved the idea of being able to hear what goes on under the ocean’s surface, a gift otherwise reserved for mermaids. Unfortunately many years later, someone laughed at my childhood belief. 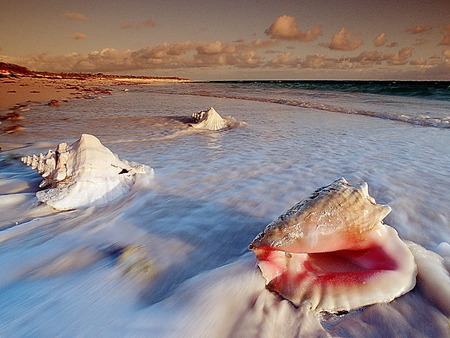 I was informed that the sound we hear when we hold a seashell to our ear is not the ocean, but rather the sound of blood surging through the veins in our ear. Why would anyone ever want to hear that? And more important, why would anyone want to dispel such a neat, harmless myth? Myths are fun things to hold on to, they are part of the fantasy of life. It’s funny how a young child seems to want the answer to what they suspect is a myth…. Is Santa real? Is there really an Easter Bunny? And what about the pot of gold at the end of a rainbow? Those were always difficult questions for me when my children asked them. I could answer the questions about bodies changing and how babies were born, but dispel a myth about Santa? I couldn’t do it…and so I didn’t. I need to believe that with all the noise around the world, I can at my whim, tune it out and listen to the sounds of the sea. And while I am willing to let go of the visual of a heavy-set man in a red suit flying through the sky, I need to believe there are many Santa men and women who help others just because they want to, just because they care. I wish upon stars, I say prayers to Saint Anthony to find lost objects, and when I see a rainbow in the sky I feel the promise. I believe in many myths because I can. I do not have the need to prove them or understand them, I just enjoy them. As women, aspiring to be at our personal best, it is important for us to establish our belief system. We believe in certain principles that become the underpinnings of our character. They define us! We make our way through the world aligning our behavior with these beliefs, sending a clear message to others around us. There is tremendous power in our belief. As women seeking to have a high SUCCESSTROGEN level, we question the lack of order or fairness in our environment, dispel certain myths, and bring about appropriate change. We have dispelled many myths about women and their ability to excel in male-dominated industries such as medicine, technology, and sports. We have changed the world and continue to do so…all because we believe. You have my word: I will continue to dispel the myth about woman not belonging in the business world. But for now, if you don’t mind, I will hang on to my belief in seashells and rainbows and Santa …just for fun. And what about you? What are the beliefs that you are passionate about, the ones that cause you to act?